Doctor Who (Classic): "Spearhead From Space"
"Spearhead From Space" / "Spearhead From Space" / "Spearhead From Space" / "Spearhead From Space"
It's a Whovian truism that whenever the Doctor regenerates, Doctor Who reinvents itself as well. But the debut of Third Doctor Jon Pertwee in 1970's "Spearhead From Space" was a far more radical refocusing of the series than any other regeneration—not merely adapting the tone of the show for the quirks and strengths of a new lead actor, but massively overhauling everything, from the mood and the look to the kinds of stories the show would tell. If it hadn't succeeded, I'm not sure we'd still remember Doctor Who today, let alone be publishing articles about it 41 years later. A bit of background: As the 1960s were winding down, so were Doctor Who's ratings. Patrick Troughton had also decided that after three years, it would be wise to leave the show to avoid typecasting. Although there were some creative triumphs in Troughton's last season, particularly "The Mind Robber," my impression is that the show was increasing seen as stale and formulaic in comparison to Star Trek as well as other British sci-fi shows of the time, like The Prisoner and The Avengers, all of which had also proven that grownups, not just kids, would tune in to this stuff if the stories appealed to them. And so when Troughton left in 1969's "The War Games," the producers took the opportunity to wipe the slate clean. The Second Doctor was captured by the Time Lords, the people from whom he'd been a fugitive all this time. His human companions were sent back to their own times with their memories erased, and the Doctor himself was sentenced to a combination of death (enforced regeneration) and exile to Earth. The last we see of Troughton is him spinning away into a black void, screaming. But the show was also grounded in the sense of striving for a more serious and realistic tone, and for lacing its sci-fi adventures with social relevance. The whimsical fantasy and surrealism of "The Mind Robber" would have been completely out of place here. In this, the show is making a deliberate step away from the campiness of some of its contemporary competitors. For example, the scene at the end of the third episode of "Spearhead," when General Scobie is attacked by his Auton duplicate, wouldn't have been out of place on a show like The Avengers. But there it almost certainly would have been played at least slightly for comedic effect—here, it's meant to be (and even today, largely still is) straight-up terrifying. Where Batman and The Avengers revelled in the goofy side of sci-fi, Doctor Who's seventh season took inspiration from a much grimmer predecessor, Nigel Kneale's 1950s Quatermass serials, which followed a format Doctor Who fans will immediately recognize—eccentric scientist protects Earth against alien threats—and also strove for a sense of gravity and awe, going not for Batmanesque zaniness but cosmic horror in the Lovecraftian mode. Doctor Who would ramp up the horror elements later in the 1970s, but in the early Pertwee run the major influence was the sober realism, and the sense that all this could be happening in real life. "Spearhead" begins slowly, keeping both the Doctor and the alien menace of the Autons on the down-low for most of the first two episodes. Instead, we're given time to acclimatize to an Earthbound Who by meeting first the stiff-necked Lethbridge-Stewart, who deals not only with outer-space threats but a mundane gaggle of pesky reporters, and then the grumpy and skeptical scientiest Liz Shaw, who is rightfully irritated at being forced to leave her research job to work for UNIT, and reacts to the Brigadier's stories about extraterrestrials with scorn. Liz, like many of the Doctor's companions, is our perspective character here, and her skepticism reflects the fact that the show was deliberately courting more grown-up viewers, for whom suspension of disbelief was something the show would need to earn. That's not to say that the show is completely leached of humor. Most of it, in fact, is provided by Jon Pertwee, who fills in as comic relief for the first half of "Spearhead" while the burden of the plot is carried by others. He spends most of this time unconscious, delirious, or gagged, but even before he takes center stage, we get a sense of who the Third Doctor will be: courtly and charming, with at least a touch of childish petulance and an and innate distrust of authority figures. Before Doctor Who, Pertwee was known mainly as a comic actor, so his clowning in the hospital scenes is to be expected. But the opera-cloak and frilly-shirt wardrobe and fancy red convertible he commandeers, dandified though they are, are also meant to echo the style-conscious John Steed of The Avengers and the gadget-heavy James Bond films. Troughton was a wandering space hobo, but Pertwee will be much more flashy, elegant, and sophisticated. He's also a little hypocritical, perhaps: Three might dislike authority figures but he's not above acting high-handed himself, bullying his way past the UNIT soldier guarding the parking lot to get in to see the Brigadier. As for the Autons: Surprisingly little is done with the concept of homicidal living plastic—the following year's sequel "Terror of the Autons" plays around with the idea a lot more, but here the Auton threat is mostly buildup, and the actual invasion is dispatched almost perfunctorily. That's OK, though: The Autons are of secondary importance to the story; the main thing is to introduce the leads and the new setting. 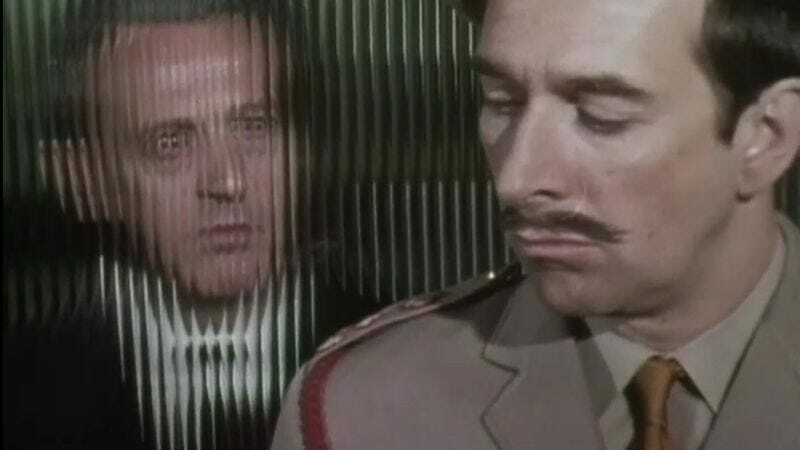 Having said that, they do provide some effectively chilling moments—particularly Hugh Burden as Channing, the sinister leader of the invasion force, who gives off a wonderfully creepy vibe just by holding his body with an unnatural stiffness and not blinking enough, not to mention that great stare he gives the Brigadier from behind some distorting window glass. And brief as it is, the scene in which the Auton mannequins break out of their shop windows and begin slaughtering people is brilliantly done. The essential ordinariness of the urban setting, with shop windows and people waiting at bus stops, is key to what makes it work. The eyeless Auton mannequins achieve real terror because they're a slight but sinister variation on the everyday—a small step away from normal, come alive to kill us. The tentacled Nestene brain which the Doctor defeats in the finale is not nearly so effective, if not quite the embarrassment I remember from previous viewings. But it's still too reminiscent of that scene at the end of Ed Wood's Bride of the Monster where Bela Lugosi flails around pretending to be attacked by a giant rubber octopus. Pertwee's ridiculous expression as he struggles with the monster doesn't help. But even though it doesn't quite work, you can see that they were aiming to emphasize the horror of the situation—the Doctor seems to be in real danger, and if his facial expression is goofy, the panicked choking sounds he makes are really quite unnerving. The major flaw in "Spearhead" is pacing: It takes too long to establish the new status quo before getting into the action, and is almost over before the Auton invasion swings into high gear. There's a lot of conversations with people standing around in offices, or sitting behind desks. Keeping the Doctor unconscious or bedridden for nearly the whole first half gives some breathing room for the Earthbound setting, but it also delays what we've actually tuned in to see, and what will always be the show's main draw no matter how much they tinker with the setup: The Doctor, fighting monsters. It's a little uncanny, by the way, how the relationships between the Doctor, Liz, and the Brig, echo (surely coincidentally) Mulder, Scully and Skinner on The X-Files—a brilliant but odd expert in the paranormal teams up with an equally brilliant but skeptical female scientist, and both chafe under the supervision of a straitlaced boss who is both ally and thorn in their side. The Brigadier even rattles off a Mulderian explanation to Liz about what UNIT is for: "We deal with the odd, the unexplained. Anything on Earth… or beyond." The Brigadier and UNIT would be a major presence for the rest of Pertwee's five-year run and beyond, but some of the innovations of "Spearhead" would only last through Season Seven. All three of the next serials, "The Ambassadors of Death," "The Silurians," and "Inferno," tackled weighty moral and political topics that would rarely be dealt with quite so forthrightly later. (Though it's also true that Pertwee's whole run was full of socially conscious/lefty/countercultural material.) And Caroline John would leave the show as well, which is both understandable and a missed opportunity. My impression is that the producers didn't really know what to do with a strong, smart female character. More than most companions, Liz was nearly the Doctor's equal. Her cynicism and skepticism was a good quality for a scientist, but also a sometimes offputting character tic. She was replaced by a far sunnier but far less bright assistant in Katy Manning's Jo Grant—whose qualifications to help the Doctor, as described by the Brigadier in "Terror of the Autons," are "someone to pass you your test tubes and tell you how brilliant you are." Don't get me wrong, I like Jo's character quite a bit, but that's a pretty big step backwards. Pertwee's final year would introduce Elisabeth Sladen as Sarah Jane Smith, who split the difference between Jo's charm and Liz's brains, and I don't think it's coincidental that Sarah Jane is widely considered to be the quintessential Doctor Who companion. But it's too bad Liz Shaw didn't get more than one season. Still, for the most part, the template established in "Spearhead" stuck firmly for Pertwee's entire five-year tenure, and even became a bit of a stumbling block when the show reinvented itself again with Tom Baker's Fourth Doctor. But more on that next week, when we look at Baker's debut in "Robot." • A huge amount of credit for the success of "Spearhead From Space" must go to its scriptwriter, Robert Holmes. This is the first Holmes story we're tackling in this series, but it certainly won't be the last. He's arguably the best the show ever had, and responsible for many of the series' best installments, including "The Time Warrior," "The Ark In Space," "The Brain Of Morbius," and "Pyramids Of Mars." • While the show as a whole is going for added realism, it's also taking steps to emphasize the Doctor's alienness—here, for the first time, we discover that Time Lords have two hearts. 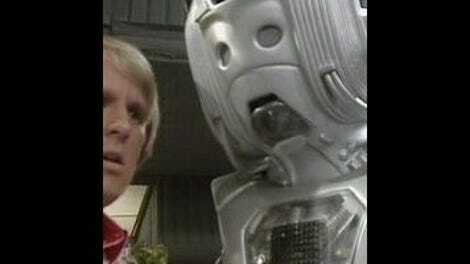 • Why does the Doctor's anti-Auton machine suddenly fail? Apparently, it's simply been unplugged: The cord is lying next to it on the floor as Liz tries to restart it. • Note the sign on the door in the hospital when Pertwee steals his outfit: "Doctors Only." July 10: "The Twin Dilemma"
July 17: "Time and the Rani"
July 31: "Doctor Who: The Movie"